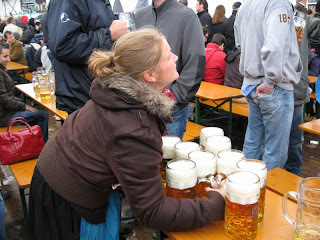 In 2008, my family, friends and I went to the "real" Oktoberfest. Our group of 14 piled into two 9 passenger vans and drank our way across Europe. It was such a great adventure, filled with laughter, new friends and drinking our weight in beer. We woke up super early to go and wait in line to try to get into a beer tent. This is where all the action of Oktoberfest happens. We didn't know that the particular day we were doing it was a national German holiday and everyone was trying to get in. In the end, we didn't make it in a beer tent but we made it to the beer garden outside with picnic tables and beer service. 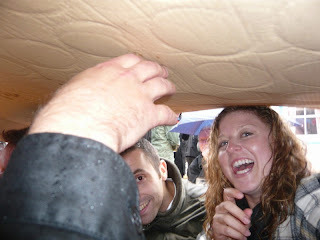 This included a rain storm where we continued to drink our beer under cardboard boxes. That is how we roll! 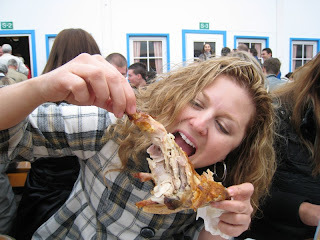 When we were in the beer garden, we had the most delicious chicken I have EVER had. I do understand that part of why it tasted so good was the pouring down rain, good company, German atmosphere, and of course a few steins of authentic Oktoberfest brew. I have always wanted to try to recreate this chicken. It is now October (I can't believe it!) and it is time to celebrate fall and I think this is the perfect recipe to do it. Fall is my favorite season and it is time to put on some comfy clothes, pour yourself a cold beer, and have some delicious roasted chicken. I have never roasted a whole chicken before so this should be an adventure! Prost! Pour Sam Adams Oktoberfest into pan and place in 425 degree oven for 40 minutes, basting every 10 minutes with beer and pan drippings. These ladies get buff hauling all the steins around. First of all - WOW. I am loving the new look, Beauties! This looks awesome and so fresh. Props!! Second - YUM. :) I'm so excited to roast some chickens! Is that all it takes to get buff, slinging steins around? Happily. So pumped to try this chicken and wash it down with a cold one. Roast chicken is one of my all time favorite foods and it's perfect for fall. This recipe looks so good that I'm not sure if I'm going to want to change it up! I can't wait to post about my first chicken!